Polysafe recently supplied concrete blocks for BOC UK & Ireland delivery vehicles. The blocks were used as ballast weights as part of a programme that has successfully been rolled out to depots all around the UK. For years, BOC used pallets of scrap cylinders as truck ballast for applications such as MOT brake testing. A better solution was needed and Polysafe were chosen to provide same-weight concrete blocks which would fit into BOC's standard vehicle pallet. BOC were pleased with the service provided by Polysafe. Peter Lambert, Package Development Manager, commented: “For years BOC used pallets of scrap cylinders as truck ballast for such applications as MOT brake testing. 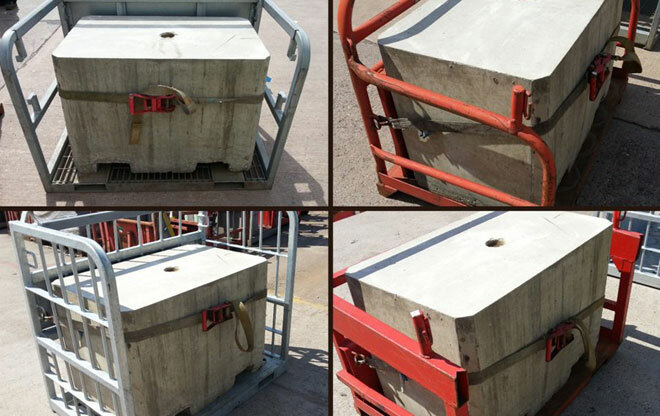 A better solution was needed and Polysafe were chosen to provide same-weight concrete blocks which would fit into BOC's standard vehicle pallet. This solution is now proven and has enabled the removal from service of old and unsightly scrap cylinders. Polysafe were at all times responsive and professional and I would be happy to engage them for any future similar project". To find out more about our concrete blocks solutions contact Polysafe Blocks and Barriers.